(CNN) Everyone exposed to formaldehyde in some laminate flooring could experience adverse health effects, according to a revised report issued by several government agencies. The revised report, released Tuesday, also found lifetime cancer risk from the flooring to be higher than identified in the original version of the report. The report, issued by the National Center for Environmental Health at the U.S. Centers for Disease Control and Prevention and the Agency for Toxic Substances and Disease Registry, says the issues are specific to laminate wood flooring produced in China and sold by Lumber Liquidators, based in Toano, Virginia. The company, which claims to be “the largest specialty retailer of hardwood flooring in North America,” said it stopped selling the products last year. “The revised report concludes that irritation and breathing problems could occur in everyone exposed to formaldehyde in the tested laminate flooring, not just in sensitive groups. The report also increased the estimated lifetime cancer risk from breathing the highest levels of formaldehyde from the affected flooring all day, every day for two years. The lifetime cancer risk increased from the previous estimate of two to nine extra cases for every 100,000 people to between six and 30 extra cases per 100,000 people,” the CDC and ATSDR said Tuesday. “The American Cancer Society estimates that up to 50,000 of every 100,000 people may develop cancer from all causes over their lifetimes,” the CDC said. The original report found the risk was three times lower than the risk identified in the new report. First released on February 10, the report was pulled from the agency website on February 19, “after it was discovered that an incorrect value for ceiling height was used in the report’s indoor air model, resulting in a miscalculation of airborne formaldehyde concentration estimates,” according to a statement announcing the revision. Last year CBS News aired a story by CNN’s Anderson Cooper on “60 Minutes” that found formaldehyde levels in certain laminate products exceeded standards set by the California Air Resources Board. For the story, “60 Minutes” did its own testing on laminate flooring available at Lumber Liquidator stores in five states. Thirty-one boxes were tested from Florida, Illinois, New York, Texas and Virginia. This prompted the Consumer Product Safety Commission to run its own tests of these products manufactured in China between 2012 and 2014. Then it asked the CDC and the disease registry to review the test results and reassess the health effects. Formaldehyde from the tested products resulted in irritation of the eyes, nose and throat. Breathing problems were reported in individuals with asthma and chronic obstructive pulmonary disorder. 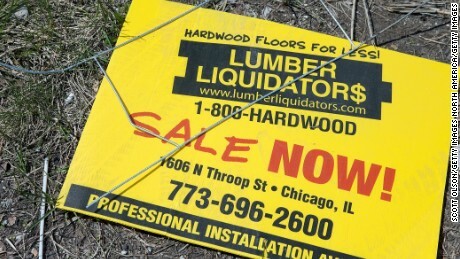 In March 2015, Lumber Liquidators said it would continue to sell the products, but in a press release issued Tuesday the company said it stopped selling the products in question in May 2015. The new report has been independently reviewed by the Environmental Protection Agency, the Department of Housing and Urban Development, experts from the Consumer Product Safety Commission and outside experts. Lumber Liquidators paid the board $2.5 million, which was deposited into the California Air Pollution Control Fund. The fund is designated for improving California’s air quality through research and other projects. Lumber Liquidators also committed to work with the board to develop a program that will “set a new standard for the industry and ensure that all products are tested appropriately and consistently on behalf of consumers and businesses,” according to a company statement. The Air Resources Board said samples of laminate flooring its inspectors took between September 2013 and May 2015 exceeded safe levels of formaldehyde even though the labels identified the products as meeting standards. “We’ve strengthened our quality assurance procedures, launched the largest voluntary testing program in our nation’s history and, in May 2015, voluntarily suspended the sale of all laminate flooring sourced from China,” said John Presley, Lumber Liquidators chief executive officer. What if you have these floors? Advice for consumers remains unchanged from the initial report. Individuals who have this type of flooring should take steps to reduce exposure, including opening windows daily to get fresh air, using exhaust fans and reducing other sources of formaldehyde, such as tobacco smoke. Anyone with the floors who is experiencing symptoms such as eye irritation and breathing difficulty should seek medical attention. Professional air testing should be considered if symptoms are persistent.